Other ways funders can follow our strategic guidance beyond supporting direct service programs, such as getting involved in advocacy or systems building at the local, state or national levels. Many low-income children enter kindergarten with a significant learning gap compared to wealthier peers,3 and research shows that it is quite difficult to make up that gap over the course of a child’s education.4 Promising approaches to closing this gap include intervening early to develop vocabulary and pre-literacy skills for preschool age children, and improving literacy instruction in the early elementary years. Note: many of the programs noted under Provide Great Places to Learn also improve pre-literacy and school readiness. Success for All is an elementary school reading curriculum and teacher training program that has been shown through multiple, rigorous studies to improve children’s literacy skills. Reading Recovery is a program developed by the Reading Recovery Council of North America, which is a membership organization for teachers. Reading Recovery provides specialized training and materials for teachers, who in turn provide targeted support to first graders who struggle with reading. Sobrato Foundation SEAL Program is a promising program being tested with English Language Learners from pre-K to third grade in California. The SEAL program provides a language- and text-rich curriculum and environment in both Spanish and English. Research has found that children in professional families hear approximately 11 million words per year; children in working-class families hear about six million words; and children in welfare-recipient families hear approximately three million words annually.5 Newer research has found that gaps in children’s language by socioeconomic group are evident as early as 18 months.6 While there is still some uncertainly as to what combination of quantity and quality of linguistic interaction with children is most effective,7 making sure that low-income children are exposed to a richer language environment at home is nonetheless a promising way to prepare children to eventually become strong readers. 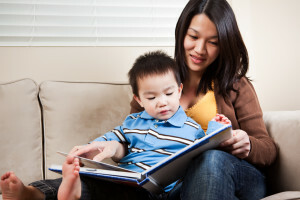 Note: Many of the programs and interventions noted under Weave a Web of Support also teach parents about the importance of literacy and positive verbal interaction with children. Reach Out and Read partners with local hospitals and pediatric clinics. Doctors and nurses are trained to “prescribe” regular reading to parents with young children during well-visits, and the program provides age-appropriate books for them to take home. Save the Children implements Early Steps to School Success, a U.S.-based program that provides home visitation, book exchanges, and parenting classes for low-income, rural families. Save the Children is currently working with the working with the LENA Foundation to test whether a language tracking device can help parents increase and improve their linguistic interactions with their children. The city of Providence, RI is also experimenting with this technology. Springboard Collaborative (full profile below) has developed a promising, multidimensional approach to tackling children’s learning gaps. Springboard partners with schools to coach teachers in effective literacy techniques, while at the same time working intensively with parents to support children’s learning at home and during the summer. Local Libraries, particularly branches in low income communities, are another way of making sure parents and children have access to books and digital teaching resources. Reading is Fundamental and First Book provide low-income children with access to free books and other educational materials. Low-income children’s learning levels tend to fall during the summer, while their wealthier peers either hold steady or advance. Supporting summer learning programs for low-income children is another way funders can ensure children master the literacy skills they need. Check out our blog for more information on effects of summer on learning and options for funders. BELL (Building Educated Leaders for Life) runs both after-school and summer programs for low-income students. BELL works in conjunction with schools and parents, and has demonstrated improved learning levels and engagement among participants. Summer Advantage works with school districts to offer a summer academic enrichment program to struggling students. The program runs approximately five weeks and provides instructional support in literacy and math as well as art, gym, music and field trips. Horizons partners with local public schools to identify students, and independent private schools and colleges to use their campus facilities to provide an enriched academic experience for selected low-income students. Campaign for Grade Level Reading provides background information on literacy-related issues and brings funders, advocates and policy makers together to help assure a seamless system of care, services, and supports from birth through third grade. This includes policy and practice that promotes children’s optimal social, emotional, and cognitive development; improves professional development for the early childhood education workforce; and supports parents as their children’s first teacher. 2Hernandez, D. Double Jeopardy: How Third Grade Reading Levels and Poverty Affect High School Graduation. Annie E. Casey Foundation, April 2011. 3Zill, N., & West, J. (2001, March). Entering kindergarten: A portrait of American children when they begin school: Findings from the condition of education 2000. Washington, DC: U.S. Department of Education, National Center for Education Statistics, NCES 2001-035, 27. 6Fernald A., Marchman V. A., Weisleder A. (2013). SES differences in language processing skill and vocabulary are evident at 18 months. Developmental Science,16, 234–248.